When players think about medieval strategy games, they immediately picture Total War-centric games where you control large armies of sword-wielding, heavily armored knights and charge them down the field towards a similarly-equipped opposing army. However, the Middle Ages were also filled with diplomatic intrigue and religious politics; war was only an element of the larger picture, albeit a big part. 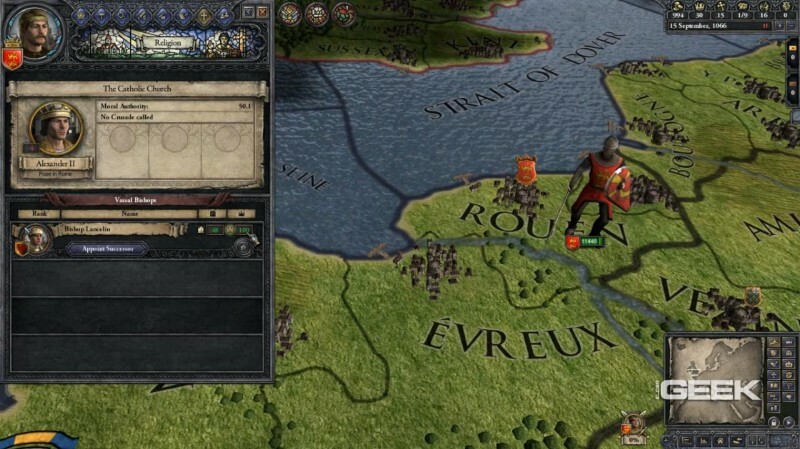 Strategy developer Paradox Interactive fuses together these elements into an encompassing Medieval experience in Crusader Kings II. Playing as a feudal lord in Medieval Europe, you establish your domain and reputation while ensuring the survival of your dynasty. As a feudal lord, your first priority is to make sure you have a legitimate heir to inherit your domain. If an heir is not found, your lands will end up in the hands of a pretender and it is game over. Crusader Kings II explores one of the defining periods in world history beginning in 1066. 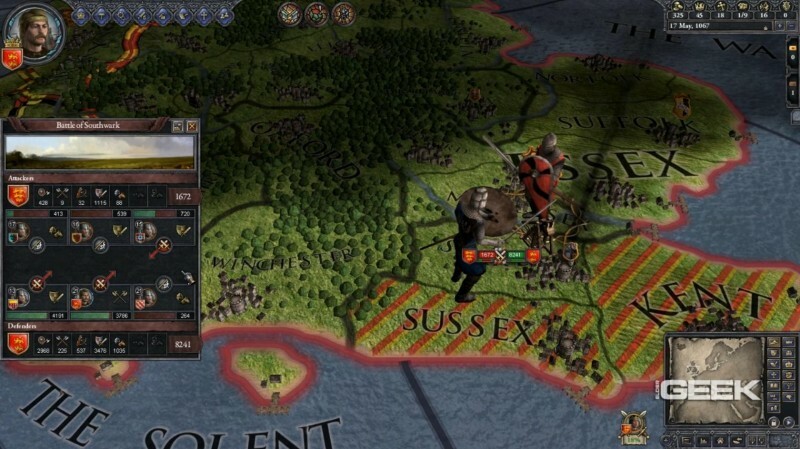 Featuring a few select periods in a grand single-player campaign, players can experience important periods throughout the Middle Ages including the Crusades, Norman Conquest of England, and the Hundred Years War. CKII also features multiplayer, where you can play through the campaign with up to 32 other players, making for more unique experiences. Internal and external politics, religion, technological research, and warfare all play crucial roles, each with great depth requiring a lot of management. 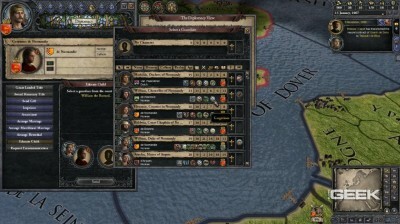 Players need to hire a five-person council, one for each of the game’s main attributes: a chancellor, marshal, steward, spymaster, and court chaplain. Each council member can conduct one of three actions at a time in the realm including improving relations, training troops, researching technology, uncovering plots, and converting religions. Just by knowing what genre it is a part of, Crusader Kings II is one of in-depth management in both military and political spheres. What sets this apart from the rest of the grand strategy titles of the past is that there are heavy elements of internal, dynastic and individual diplomatic aspects in addition to the generic formula of foreign relations. This may seem a little overwhelming for the fainthearted, but Paradox actually makes this one of the most interesting and enjoyable experiences in the game. Aside from managing the problems of inheritance, there is also the importance of keeping vassals and courtiers happy through awards of territories and ceremonial titles as well as arranging marriages and so forth. Managing the day-to-day tasks of the realm is also much easier than in past strategy titles due to the fact that the time period is one of feudalism where vassalages are essential in keeping the peace and making life easier in the long run. To complement this system, the game’s AI does a pretty competent job in managing development. The only downside to this feature is the inability to directly control more territory without incurring a tax penalty and negative prestige among your retainers as well as across the continent. However, for those feeling overwhelmed with doing everything in a large expanse of territory, limiting direct control is a god-send. Religion and Church politics is also featured prominently in the game as it is important to display your piety to the Pope by essentially flattering him through bribes and going on holy crusades against the heathens and heretics. If you can sway the clergy at home to support you instead of the pope, you can appoint select clergy as an anti-pope. Depending on how you play and how close you are to the Church, this feature may vary in degrees of influence on your playthrough. Of course, Crusader Kings II would not be complete without some warfighting. Managing armies is done through raising your own personal levies and those of your vassals to create large armies in order to launch expeditions abroad or quell uprisings at home. If you are looking for big battles, there really isn’t any here. Unlike the Total War series, warfare is one of many elements that make up the full experience of the game. Once you send your army into battle, the AI takes over and the outcome is determined by modifiers and factors such as environment, leadership, and training; meaning once the fighting starts, you can’t do anything to affect the outcome. Overall, Crusader Kings II is one of the most engaging Paradox strategy games to date. The main concern, however, is the lack of an ability to play as a non-Christian faction such as the Mongols or Muslims, which will probably be remedied with DLC or mods in the near future. Other than that, the intricacies of politics, religion, and warfare as well as an appealing time period makes this a pretty addicting strategy game. Every playthrough is unique with many possibilities and no one way to win. That being said, anyone can be master of their domain. This is totally up your alley then, zky! I was sucked in within an hour. No joke. Looks huge, but not my thing but I really like the music it reminds me of the old Tomb Raider games, you didn’t say anything about that in the review, shame because it sounds very good for the time setting. How does the 32 player multiplayer work? sounds mad, I haven’t heard of any strategy having that many.